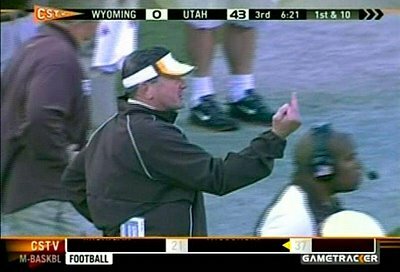 Maybe Joe Glenn had it right vs. Utah? For almost one full week the Mountain West was knocking on the door of an automatic BCS birth after this coming seasons evaluation period but those chances took a hit once again. Why? The Utah Utes are chasing the money (who can blame them?) and are leaving the MWC in favor of the Pac-10 who now has 12 teams after adding Colorado to the mix last week. I am very surprised about this development in general because I never thought Utah would leave the MWC if they couldn’t take BYU with them. Now the people in Utah are trying to justify their move by claiming going to the Pac-10 makes “The HolyWar” more intense . This is a pretty crazy statement but good for them, they are cashing in their recent football success for a major pay-day that will help sports programs and academics. Now let’s send them a nice parting gift by taking it to them at the War on October 16th!!!!! ← Welcome Aboard Boise State!!! !